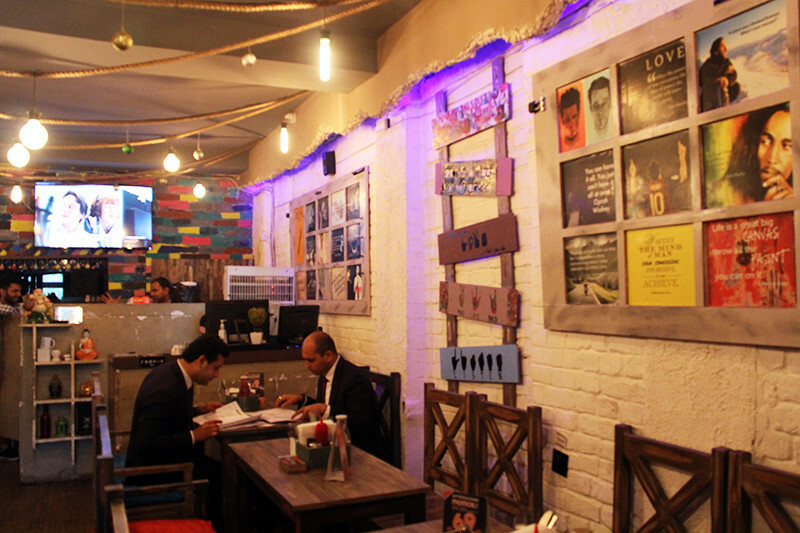 North Campus is famous for its numerous hang out joints, various eateries, chai addas and roadside theals. So, to change the pace - rather than hanging out in North Campus, we decided to do something different! 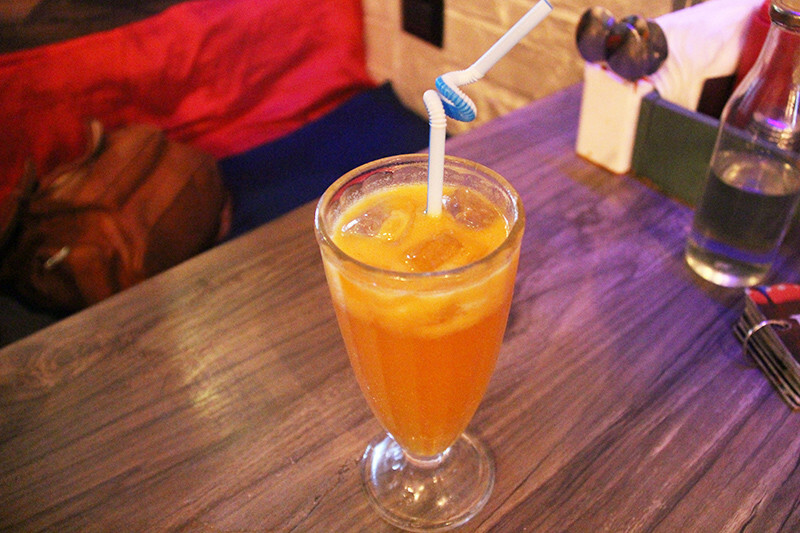 We decided to check out South Campus’ famous spot, Satya Niketan, bang opposite Sri Venkateshwara College. Goddammit! IT. IS. HUGE!! It’s filled with so many eatries that one might need a few lifetimes to try ‘em all out. After walking for a while, at the end of all the closely-stacked eateries, we entered Echoes. Read on! It’s on the first floor, with a cutesy blue door and many motivational posters hanging on the wall outside, plus there were fairy lights going zig zag over our heads. As we entered, the thing that caught our eyes was this big showpiece of something that looks similar to Gandhiji’s three monkeys up on the wall! Conversations flowed easily around us and the latest music blared out of the speakers. Now the most important thing about this establishment is that people who serve here are physically challenged. But that doesn&apos;t stop them from providing exemplary service. We were seated on some low level seats with ample space. We were provided with a notepad to write our order. The good thing is that we didn’t have to write the whole name of our dish; we just had to write the codes provided in front of the dish on the menus. To call the servers, there’s a switch beside every seat and you just had to press it. Also, if someone doesn’t know sign language and wants to ask for something specifically, there are some cards provided on every table with stuff like “Thank You”, “Bill Please” and “Spoon Please” handily emblazoned on them. This place has a dedicated balcony for smokers and there’s also a couples spot, away from everyone, near the window, giving a pretty view of the area. Wanna know what we dug into here? Scroll away! As the name suggests, it’s red. Duh! Just kidding, it’s actually pink. Okay in all seriousness - it’s a red velvet shake! Yep, that cake you eat - the one and the same. As expected, it was AMAZINGLY YUMMYLICIOUS! The shake felt like a cross between ice cream and cake. Thankfully, it was not overly sweet. 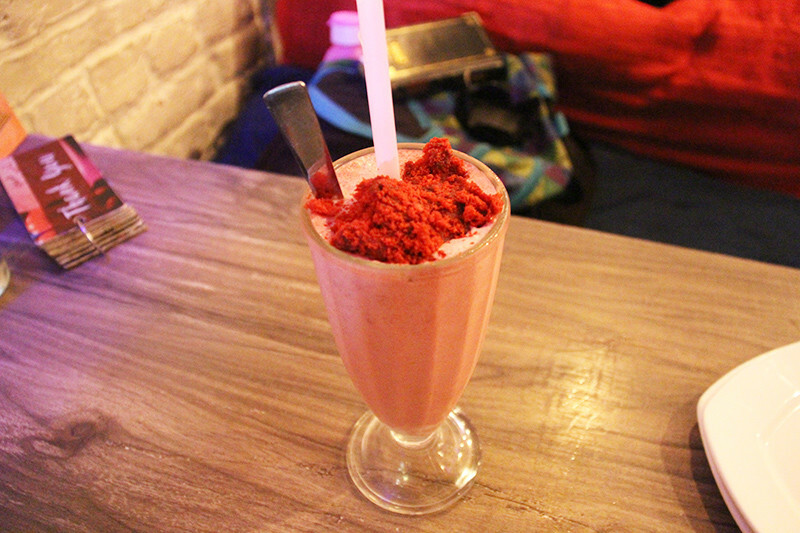 It had a bit of strawberry flavour to it as well and was topped with crumbs of red velvet cake. Instead of being hot, it was served chilled *wink wink*! This was an orange based drink with lots of soda. It had a tangy and citrusy flavour and was really refreshing, but came up short as compared to their Red Rave, which was fantastic. 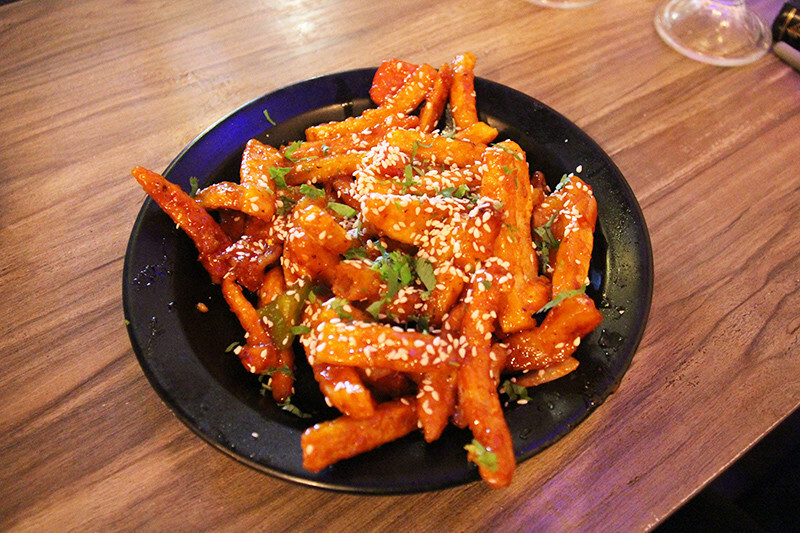 This is one of those dishes which you gotta try anywhere and everywhere you go! The potatoes were finely cut and very crispy. They were très chilli and nicely honey laced, without making them soggy. Defo go for this as a nice and appetizing starter, folks! This pizza is one of those things which gives you a moment of clarity and makes you realize that there’s so much to explore in this world and how badly you needed this combo in your life! The base was flatbread, which was not too thin. It was super crispy and we’ll just say - molto bene! 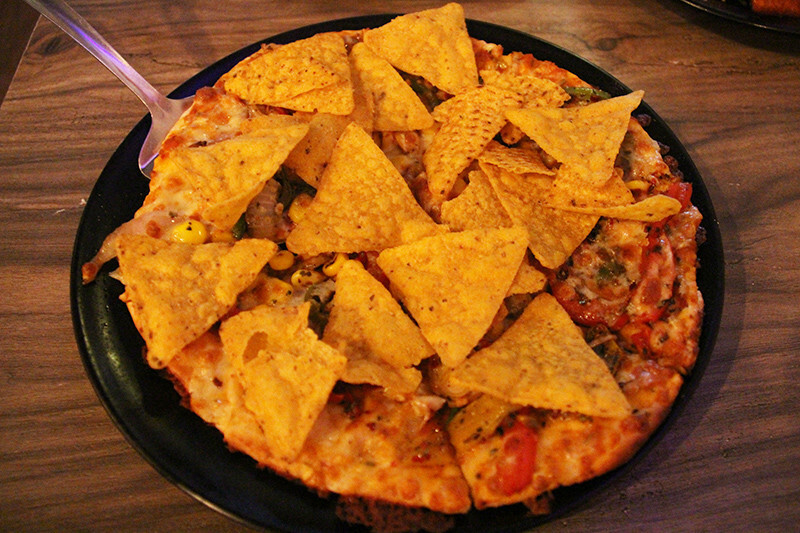 It was warm and had corn and jalapenos and *drum roll please*, it was topped with NACHOS! The nachos were crispy as well and fortunately, they didn’t become soggy. Yum yum! Who can say not to waffles at any time of the day?! 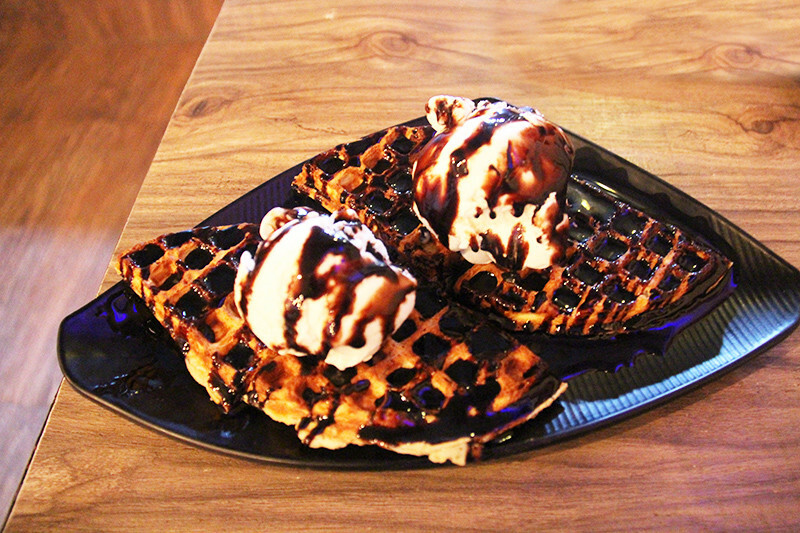 We ordered the classic Black n White which was suffused with chocolate sauce and topped with two dollops of ice cream. It was a bit difficult to cut, but tasted crunchy in the mouth. In some parts, it was soggy though, so we have a mixed opinion on this one! 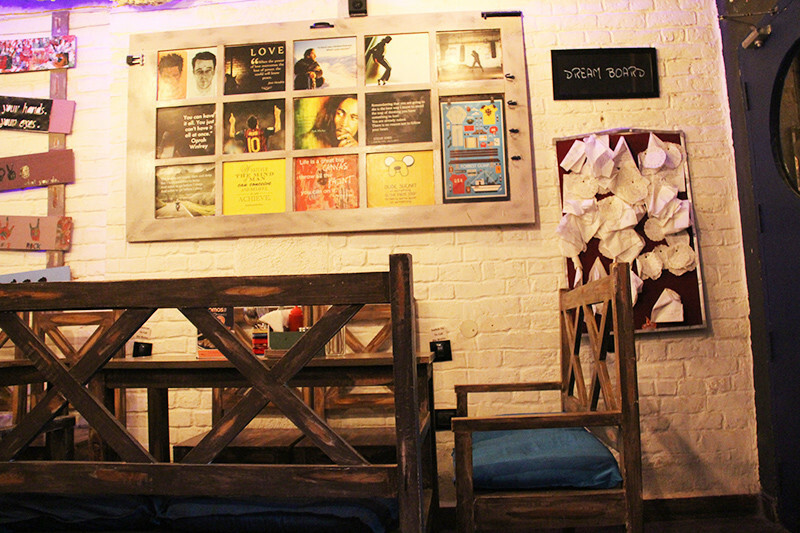 All in all, this place has taken up a nice initiative and is totally worth the experience. It’s a tad bit pricey, but believe us, well worth it. Come on by!